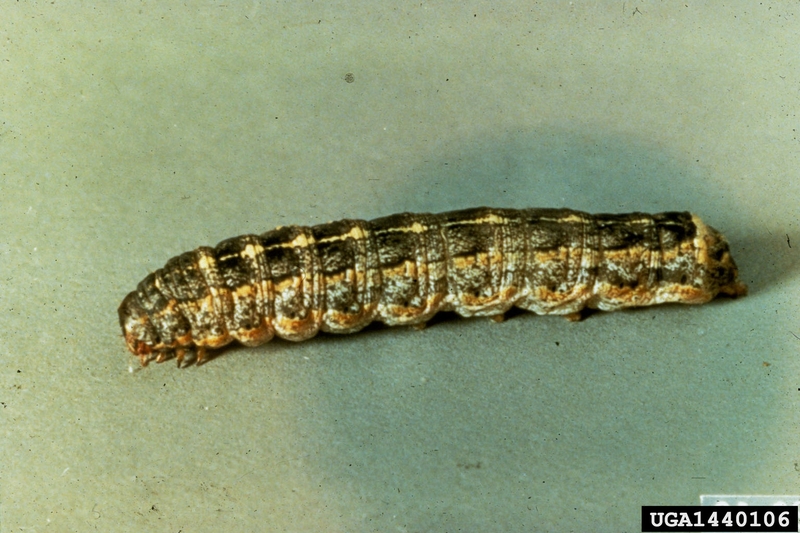 Variegated cutworms will feed on leaves, but will also chew shallow or deep holes in the fruit during mid- to late summer. Caterpillars are brownish-grey, with diamond-shaped marks along the back and light lines along the sides. They are up to 2” long. Moths from the South arrive between March and June. Eggs are laid mostly on grasses and winter annual weeds, usually near areas of the field prone to flooding. Certain fields tend to have a history of repeated cutworm damage. The larvae feed after dark while hiding under the soil surface during the day. Scout fruit for damage during harvest. Spray tomatoes if 1% of the plants are infested with variegated cutworms. For best results, make application after dark. Ground beetles, parasitic flies and wasps and other general predators help reduce populations. When corn follows sod/hay in rotation, fall-plowing may lower cutworm populations by reducing spring egg-laying sites. Weedy and reduced-till fields tend to suffer the most damage.